Despite having a bad back, Kennedy was able to join the U.S. Navy through the help of Captain Alan Kirk, the Director, Office of Naval Intelligence (ONI) who had been the Naval Attache in London when Joseph Kennedy was the Ambassador. 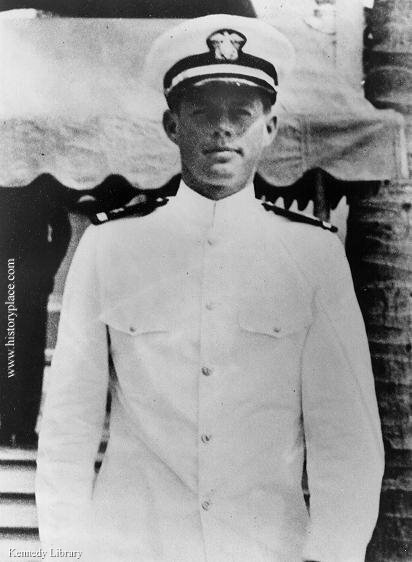 In October 1941, Kennedy was appointed an Ensign in the U.S. Naval Reserve and joined the staff of the Office of Naval Intelligence. The office, for which Kennedy worked, prepared intelligence bulletins and briefing information for the Secretary of the Navy and other top officials. In the spring of 1941, Kennedy volunteered for the U.S. Army, but was rejected, mainly because of his troublesome back. Nevertheless, in September of that year, the U.S. Navy accepted him, because of the influence of the director of the Office of Naval Intelligence (ONI), a former naval attaché to Joseph Kennedy. As an ensign, Kennedy served in the office which supplied bulletins and briefing information for the Secretary of the Navy. It was during this assignment that the attack on Pearl Harbor occurred. He attended the Naval Reserve Officer Training Corps and Motor Torpedo Boat Squadron Training Center before being assigned for duty in Panama and eventually the Pacific theater. He participated in various commands in the Pacific theater and earned the rank of lieutenant, commanding a patrol torpedo (PT) boat.